The aim of this report is to assess the likelihood of compliance in 2017 with the budget stability and debt targets and with the expenditure rule by the different public administrations. 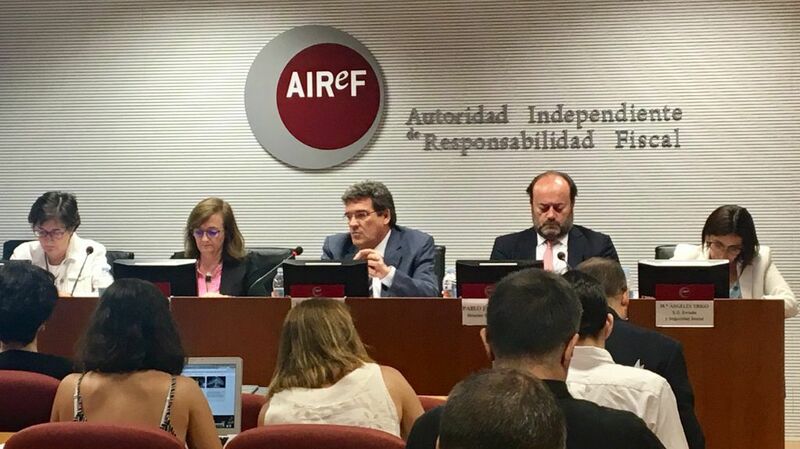 Also, for the Autonomous Regions (ARs) that have submitted information on the Economic-Financial Plan (EFP) for AIReF’s report prior to its presentation to the Fiscal and Financial Policy Council, this report includes an assessment of the 2017 and 2018 budget scenarios included in these plans, formulating the corresponding recommendations when assessing the risk of non-compliance with any of the fiscal rules. AIReF considers feasible for 2017, although demanding, the achievement of a 3.1% GDP deficit target1. The Government has provided new information, mostly related with the shift to 2018 of the projected 2017 impact of the state financial liability regarding toll roads. In relation to its last Report, the new information allows the AIReF to slightly improve the forecast of compliance with the stability target. This feasibility consideration rests on the planned adjustment to non-financial expenditure which, with growth well below GDP, would be compatible with compliance with the expenditure rule, and on the shift to 2018 of the projected 2017 impact of the State’s financial liability for toll roads on the Stability Programme Update (SPU 2017-2020). On the contrary, non-financial revenue maintains its weight on GDP, it being considered unlikely to reach the target. See Figure A1. While the stability target is considered feasible for the General Government (GG), the subsectors show mixed results: The Local Governments (LGs) will meet the targets, while the Central Administration (CA) and, to a lesser extent, the Social Security Funds (SSF), present a high risk of deviation. The targets set on 2 December 2016 do not reflect the financial situation of the various subsectors or the limitation, in some cases, to implement the expenditure rule. The latter holds true despite the delay in the CA formation process, and therefore in the setting of the targets, allowed AIReF to have more information than in previous years on the 2016 year-end for each of the subsectors and the 2017 macroeconomic scenario.